The Wheelchair Side Pak is great for holding your purse, cell phone, keys, wallet, etc. Adjustable straps, zippered inner pocket and hook-and-loop fastener(s) top flap. Long wearing nylon with mesh side pockets. 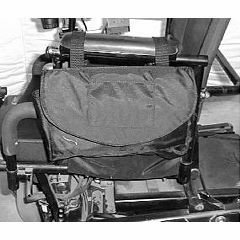 The Wheelchair Side Pak can attach to practically any part of your wheelchair; backrest, siderest, under your seat, to your cushion, the possibilities are endless! its a great size for everyday use, but its all just one big pocket, needs some smaller pouches inside or outside. This bag is way too small to hang on the armrest of a wheelchair. I will use it under the seat of my sport chair and hope that my things don't spill out. The size of this product should have been disclosed on the add. Purchased this for my Dad's power chair. He wanted something that wasn't too big and this is just right for him. Stays in Place. Easy to Use. Convenient.